Use it to Learn, Speak, Hear Sounds, Listen to Music! 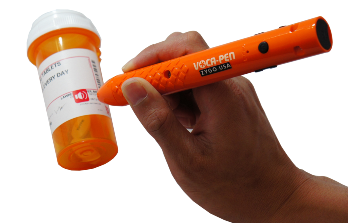 The VOCA-Pen is a sound recording and playback device that uses coded stickers to identify saved recordings, lets you record sounds and messages, and plays those sounds when you point to the stickers. Any sound can be recorded, like messages, music, words, phrases, etc. Apply stickers to almost anything: to paper, books, medicine bottles, to any product. It can be used in a variety of situations and activities, like education, learning a language, speech output (VOCA), and reading labels on containers. For blind or visually impaired individuals, it can be used to identify the contents of medicine bottles, read the instructions for administering the medications, identify contents of drawers and cabinets, etc. As a VOCA, it can speak words and phrases from a communication book. As a learning and reading tool, it can vocalize children’s books, including sounds like animal calls. Coded identification stickers for VOCA Pen The VOCA-Pen identifies recorded sounds by touching specially coded Stickers. These stickers come in three sizes: 10mm, 20mm, and 30mm in diameter. They are available in red, yellow, and blue in each size. Record a voice message linked to a sticker then speak the message to communicate. You can record any length message you like. The SD storage card on the VOCA Pen holds 4GB, which is about twenty (20) hours of recording time. The maximum recording time for any single message is five (5) minutes. Changing the volume is easy. You adjust the volume with the “up” and “down” arrow buttons on the edge of the unit. 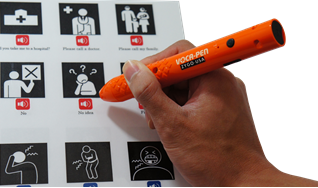 When using the VOCA-Pen for selecting the messages, it is best to hold it upright like you would a pen or pencil. 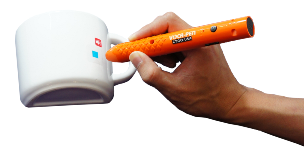 The more vertical the pen is positioned, the better it can detect the sticker. You can use the stickers more than just one time. Simply re-record the message to make a change, or move the sticker to somewhere else. Although you can re-record at any time, there is no delete function to remove messages. The only way to do that is to record silence which overwrites any stored message. There is very little feedback to the user when using the pen to select messages. There are no lights or other visual indications that you have selected the sticker. You have to rely on hearing the recorded message. Be careful not to mark on the stickers. Do not write anything on the stickers as it prevents the sticker from being read correctly by the Pen.